quickRotateShowForm which shows small form to enter rotation degree. 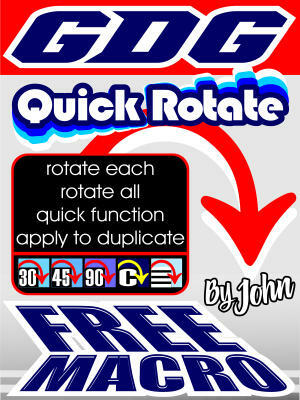 rotate30, rotate45, rotate90 which quick rotate to 30, 45, and 90 degrees when clicked. rotateCustom which rotates to value entered in QR form. Quick Rotate works with selected one or many items! Open source code. Change as needed. Click any of icons to rotate. Hold shift to rotate each item selected individually. Hold Ctrl to rotate a duplicate which is similar to "Apply to Duplicate"